Commercial Property Management Software Isn't Business as Usual! RealPage Analytics delivers the most accurate apartment data trends and industry news. Proprietary data science takes gold-standard data and delivers a smarter answer, faster—on demand, and in seconds. At RealPage, we dare to dream, disrupt, and deliver a better way. 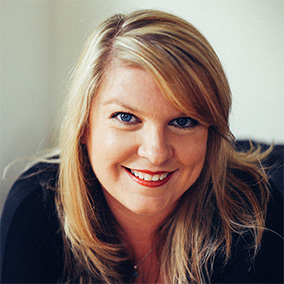 Learn about upcoming trade shows. 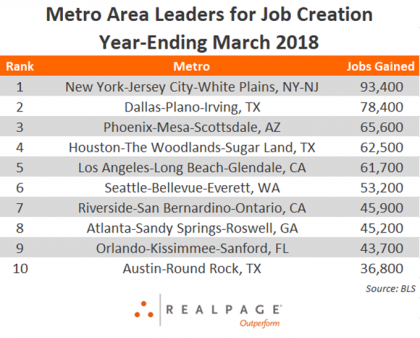 Job growth continued at a steady pace recently, and the top two job gaining metros last month remained the leaders in March 2018. According to preliminary data from the Bureau of Labor Statistics, U.S. employers added nearly 2.3 million jobs in the year-ending March 2018, growing the nation’s job base 1.6%. Among U.S. metropolitan areas, nine of the top 10 metros from February returned to the list in March, although there was some movement among the positions. New York and Dallas retained their top spots with job gains of 93,400 and 78,400, respectively. Phoenix moved up two spots, displacing Houston to the #4 rank. Los Angeles rounded out the top five with the gain of 61,700 jobs, shifting downward from its #4 spot from last month. Seattle and Riverside switched places in March. Seattle moved up one spot to place at #6, while Riverside slipped one position to land at #7. Two Southeast markets – Atlanta and Orlando – maintained the #8 and #9 positions for the third month in a row, with 45,200 and 43,700 jobs added, respectively. Austin was a newcomer to the top 10 with annual gains of 36,800 positions. Washington, DC slipped out of the top 10, coming in at #13 this month. The top 10 job gain markets in March 2018 accounted for 586,400 positions added – roughly 26% of the nation’s total job gain during that period. While strong, that recent figure came in 2,800 jobs short of the 589,200 positions those same 10 markets accounted for in March 2017. The metros most responsible for that downturn were Atlanta and New York, where annual job growth is down 30,000 positions and 25,100 positions, respectively, year-over-year. All but two of February’s top 10 annual percentage growth leaders returned to the list in March, though most of those that remained were reshuffled. Odessa held onto its top position among national leaders in the year-ending March, though the pace of growth in the Texas market waned, falling to 6.6% after registering above 7% for two consecutive months. Salinas climbed one rank to come in second, with 4.1% growth in the year-ending March. Reno was not far behind at 4%, though that showing did cause the metro to slip from its #2 standing from February. Austin climbed from #6 to #4 with annual job growth of 3.6%, while Orlando rose from #7 to #5 with an expansion of 3.5%. 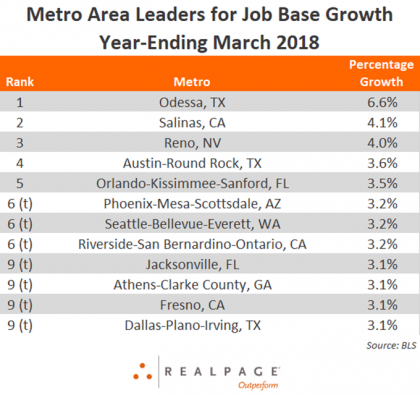 Three metros tied in the #6 position, with a job base increase of 3.2% in the year-ending March. Phoenix was a newcomer to the list, while Seattle moved up from the #9 spot and Riverside fell from the #3 position. Tying at #9 with 3.1% annual growth in March were new arrivals Jacksonville and Dallas, alongside Athens, which took a steep dive from its #3 February spot, and Fresno, which ticked down one place from #8. Augusta and Huntsville were the two metros that made it in the top 10 list in February but fell out of the nation’s top rankings in March. Both of those markets saw job growth of 2.9% in the year ending March, ranking them alongside Colorado Springs in the #15 spot. Thank you for subscribing to our blog digest. Market updates. Expert insights. Q&A.